The area of “Northern Jordan” stretches from Amman (ancient Philadelphia) in the south to the Yarmuk River and the Syrian border on the north. The mountains on the west overlook the Jordan River valley. 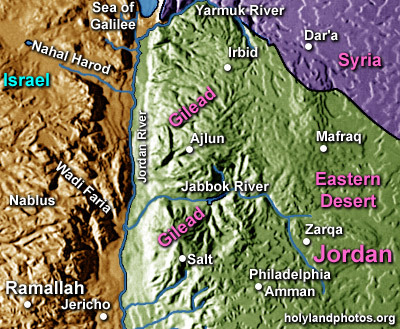 In the Old Testament this is the area of “Gilead”—a geographical and (less common) tribal name that is mentioned 110 times in the Bible. Gilead is divided in half by the Jabbok River. The northern part of Gilead reaches a height of 4,091 ft. [1247 m.] above sea level while the elevations of its southern portion are lower. The area east of an imaginary north–south line that runs from Amman is the beginning of the Arabian Desert that stretches 450 mi. [725 km.] eastward until one reaches the banks of the Euphrates River. During the Old Testament era northern Gilead was allotted to the Israelite tribe of Manasseh, while southern Gilead was allotted to Gad. During the New Testament (Roman) period this was the area known “Perea”—close to the Jordan Valley—and the “Decapolis”—a series of Greco–Roman cities that were loosely allied.